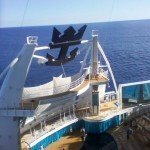 It was so exciting to receive an invitation to a pre-inaugural two-day trip aboard the all-new-game-changing Royal Caribbean Oasis of the Seas! After our on time flight, we proceeded to baggage claim to locate the Royal Caribbean representatives for our transfer to ship. 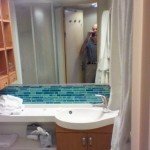 We were loaded on a bus after a very short wait and transferred to the brand new terminal 18 at Port Everglades in Fort Lauderdale (purpose built for Oasis and Allure.) We really did get from curb to gangway in 15 minutes as advertised and everyone is the terminal was very pleasant. While Oasis is making port calls, card scanning/security will ALWAYS occur shore-side prior to re-boarding to enhance the boarding process. (A great idea for a ship than holds so many people and another industry first.) 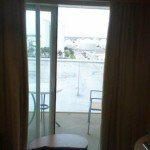 After boarding on the Royal Promenade level on deck 5 (the Royal Promenade on Oasis is much larger than the Royal Promenade first introduced on Voyager class), we easily found our cabin, D2-11702, Superior Ocean View w/Large Balcony starboard aft. 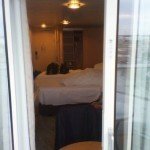 Our cabin had a very nice sized balcony and plenty of storage space inside. 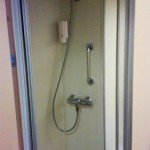 The standard cabin stall shower had plenty of pressure and was more spacious than it appeared from the outside. It also featured a footrest to make the leg shaving process easier. Interestingly enough, the vanity/basin was extremely low. 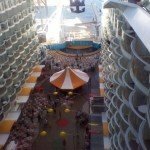 After getting our gear settled in our cabin, we headed off to explore the Oasis of the Seas and find some lunch. We stopped in the Solarium to take it all in. Seems Royal Caribbean has taken some cues from sister brand Celebrity’s AquaSpa area with the whirlpools, healthy café, etc. The Oasis includes a greatly expanded Solarium Bistro (translation healthy buffet by day and healthier alternative restaurant by night). In addition, there are cozy beach loungers and even a soothing stream. Visit the Solarium for a great retreat from some of the other hustle and bustle filled neighborhoods. In addition, do not miss the Solarium’s fresh water pool and two cantilevered whirlpools carried over from the Freedom class; also visit the Solarium bar for a beverage. We had a wonderful lunch from the large selection in the Bistro. 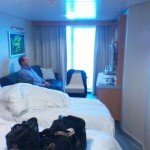 (The Solarium Bistro offers more choices than the Celebrity, Millennium class, AquaSpa Café, no disrespect to Celebrity’s wonderful onboard experience). It was challenging to remember this was the “healthier buffet” since there were so many appetizing selections. Next stop, we visited the new loft suite section on decks 17/18 with their own private area. This concept appears to be borrowed from NCL’s Courtyard area. The two level Crown Loft Suite was truly one of a kind. 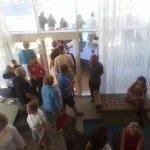 Is the Loft Suite area better than NCL’s Courtyard area? Answer: It is different. Next, we visited Central Park, a place like no other at sea. 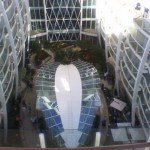 You can walk through this floating park on deck 8, over the roof of the Royal Promenade, and stop for a drink, coffee, or even pick up lunch from the Park Café to enjoy under a tree. Royal’s lineup of alternative Restaurants including the new 150 Central Park is located in Central Park. Finally, you can also visit the all-new Vintages wine bar. Take your time to explore one neighborhood at a time and perhaps plan a meal there as well. The next neighborhood is the Boardwalk. 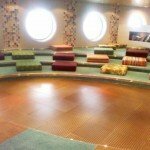 This seaside inspired family entertainment area, is located aft on deck 6. 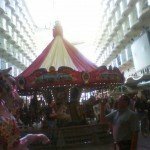 Here is where the cruise industry’s first floating carousel at sea is located complete with hand carved wooden animals. 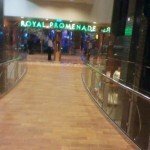 Keep in mind Royal has dispersed these three dining/shopping neighborhoods very well with the Royal Promenade midship on deck 5, Central Park, midship on deck 8, and the Boardwalk, once again, aft on deck 6. Bear in mind all of these neighborhoods lie along the route to the Opal Theatre forward and the Opus Dining Room aft. The boardwalk includes Johnny Rockets, and the new Seafood Shack along with other “high glycemic” outlets. The stern end of this area features one of my personal favorites, the all-new AquaTheater. The AquaTheater features Oasis of Dreams, Royal Caribbean’s “Cirque O” inspired synchronized swimming/diving extravaganza with dives as high as 72 feet. Been to your basic dining rooms and main show theatres? Look at the Opal and Opus, the Opus dining room is three decks high al a Voyager/Freedom Class but without the giant center opening. Further, each tier is also built out on concentric circles from the center. Therefore, even with such a large space, on each of three decks, you cannot view many tables at one time, which provides an almost intimate feel to such a gargantuan space. 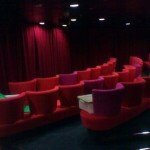 The Opal theatre is also three decks high and contains the latest in AV technology. The first night, we saw an unannounced Abba tribute show in the Opal Theatre. While not a huge Abba fan, the show was great and the theater was very comfortable. 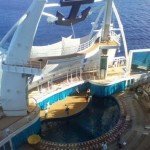 (Remember, Royal’s objective is to have many dining and entertainment venues to keep passengers dispersed as they can’t have the entire ship going from one dining room to one show lounge across two seatings, AND Royal Caribbean delivers.). Oasis is also introducing another first, on-line pre-booking for shows, alternative dining, and activities. Royal is well ware of the number of passengers trying to get to the shows and activities like the zip line, rock wall and not to mention the variety of alternative dining venues. Therefore, for cruisers who like to pre-plan all of the details, you can do it now for the Oasis. I did it for my own shows; just present your room card key for scanning at the door. Are you interested in prebooking your own activities and dining? Why not ask your travel planner to take care of the details for you? The Oasis has not forgotten about the little ones. Happy kids equal a happy vacation for the parents! 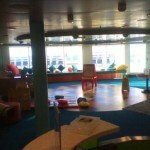 Royal Caribbean once again changes the game with their Youth Zone neighborhood entered via Kids Avenue on deck 14. 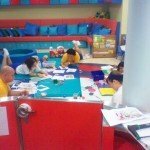 This amazing facility has the largest daycare at sea, Royal Babies & Royal Tots, large enough to rival a top shelf land based day care facility. In addition to the obligatory teen dance club and hangout area, the Oasis has the Adventure Ocean Theatre for shows put on by kids for kids! This amazing area is broken up into different rooms by age group. 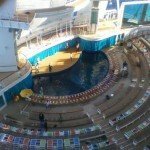 This is the largest youth complex I have ever toured on a ship! 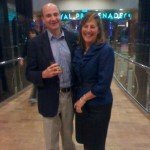 After another wonderful dining experience in the Opus dining Room, we went to see Hairspray. This was the best show I have seen at Sea, better than a lot of shows on land. The quality of the acting and singing was great along with the pit band that would occasionally rise from beneath the stage and even glide to the back while on the stage. The sets were just magnificent and the production values were amazing. Hairspray is a must see show. Shortly after this show, we were off to the Oasis of Dreams at the AquaTheater. While Royal was still working out last minute technical glitches, the show went on in a “rehearsal” format. I truly enjoyed hearing the commentary and stories about what went into this incredible production. Oasis of Dreams is also a must see on the Oasis of the Seas.